Time, Patience, and Learning To Communicate – Hi Blog! I'm Dad. It’s rare for my seven-year-old son to wake up in any mood besides joyous. He’s the happiest morning person I’ve ever known and my entrance into his room is always met with a round of applause. So that one rare morning where he wasn’t happy really stood out. He wasn’t hurt, just quiet. I came in and sat on his bed, but he looked like he was still tired. Then, suddenly, he curled his bottom lip in a cartoonish pout and a single tear fell down his cheek. It was one of the saddest things I had ever seen in person. It was Hallmark Movie sad. I didn’t know what was wrong and, since Lucas is non-verbal, he couldn’t tell me. I gave him a hug, told him everything would be OK, and brought him down for breakfast. By the time the school bus came, he was back on the smiling bandwagon. I hated not knowing what was wrong. I went through tons of mental scenarios for a few days debating what the problem could have been. I wanted to just ask him, but I couldn’t. It was one of those moments where it felt like he was so close, yet so far away. It wasn’t until his teacher heard the story that I had a viable explanation. Maybe he had a nightmare. Yup. Nightmares. Kids have those and he’s a kid, so there you go. It made perfect sense. While children with language can come running downstairs screaming about “flying pancakes trying to eat us”, Lucas has to just, well, deal with it. Hopefully not anymore, though. The first one may have gotten by, but I’ve learned that our understanding of each other is cumulative. So I will be ready when the next nightmare shows up. I don’t beat myself up about the fact that I missed it the first time. Just like Lucas, I’m constantly learning. What we don’t comprehend about each other today, we remember for tomorrow. 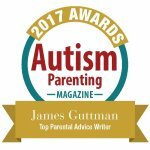 I focus a lot on the similarities that raising a child on the Autism Spectrum has with raising one who isn’t. That doesn’t mean it’s easier or that everything about raising him is simple, though. Each of my children comes with their own unique set of rewards and difficulties. There are some aspects of each that are harder than the other. For my ten-year-old daughter, it’s dealing with peer pressure – a problem Lucas will probably not have much of an issue with. For him, it’s the fact that there are some verbal interactions we need to work on in order to achieve. It’s not the interactions most people would think of, either. I can get notes home from his teacher that take the place of “How was your day?” I can use signs and iPad apps to explain “eat” or “bath”. We have looks and songs that communicate different tasks and feelings. Those are all teachable in the moment. I’m talking nightmares and other pieces of information that, even when you teach them, still take some time. Take cooking for example. Lucas learning to ask for food was a game changer for him. He loved that he could ask for a cookie through signs or apps and receive it immediately. That was wonderful for him. Let’s be honest. That would be wonderful for anybody. However, the fact that his hot meals weren’t ready the second he asked, much like a prepackaged cookie, was a huge problem. When he would request food at meal time, I would mime an eating motion while saying, “You want to eat?” To this, he would usually tap his chest and dart to his dining room seat. I said “eat.” So he’s ready to “eat”. Let’s “eat”! After what felt like decades of hearing “wait” and learning that he had no options, though, he seemed to just, well, get it. Now he knows that dinner time means he has to sit in his chair for a while and punch away at Youtube Kids while I get it ready. He accepts that. It took time, repetition, and patience. If I’m being honest, though, my son’s still not the most trusting dinner guest. Every single time I make him food, the sound of his tiny bare feet slapping up and down on the floor will grow louder until he appears behind me. I glance over to see Lucas standing tall on his tip-toes to check on what I’m doing at the counter. If there is some sort of acceptable food product or container in front of me, he will return to his seat for a few minutes, content with the knowledge that I’m hard at work. This happens every two minutes or so. I call him my little supervisor. This isn’t a unique situation. We dealt with it when it came to iPad charging too. For a long time, when his favorite screen would lose it’s power, so would we. He would yell as we ripped it from his grasp to charge. Explanations made no difference. All he knew was it was gone and, to my little guy, that could mean forever. Eventually, he got on board. It just took time. For Lucas and me, time has always been the most important thing. Time has shown me who he has become, and time has been the tool that made many interactions that I once thought impossible possible. Everything changes over time and time changes everything. I might not understand everything about him. He might not understand everything about me. If we’re patient, though, we’ll figure it all out eventually. After all, we have our entire lives to try.